Although I already have too much on my plate at the moment, I'm stupidly going to attempt to finally get a network set up here. I've had the guy that handles all of the networking for the Boston-based Coast Guard fail at it, as well as the guy that builds all my edit systems. But both of those were several years ago and I'm hoping new equipment, Windows 7 and a fresh start will have it working. I plan on scrapping any and all old settings (though I haven't researched how to "undo" past settings if that's necessary) and start from scratch. Comcast sent me an updated modem and they keep calling to wonder why I haven't installed it yet (I think they're concerned that I sold it in a back alley). I'm ordering a Linksys e4200 that will be here Monday and I'm going to set it all up through my Photoshop computer which is Win7 Pro (though I will still be adding some Vista and even a couple of XP-Pro machines if they cooperate). In my office, I have four hardwired computers and a network-capable, non-wireless color laser. In my home theater rack, I have seven items to network...all wired. I have two other laptops in the house for which I would like to have wireless available. 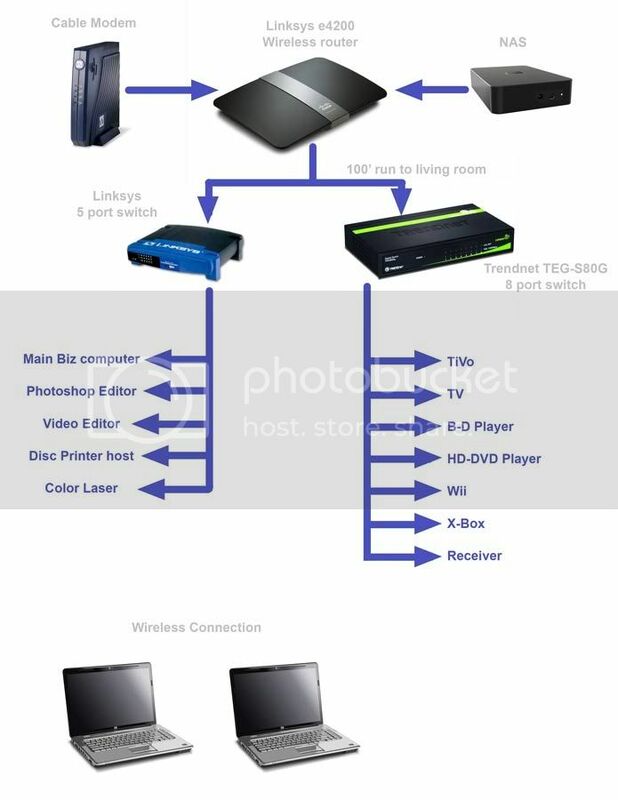 So, the questions: Is there likely to be any problem feeding two switchers off a consumer wireless router in a setup as outlined below? There are wireless routers with more ports, though they're expensive and uncommon. Am I asking to much for this wireless router..i.e., should I be looking for higher-end business solutions? The Linksys wireless router in the middle of it all is the thing you need to worry about, but it should be able to handle at least 16 unique devices without a problem. I've not heard of a consumer device with such a low limit in *ages*. Everything looks good. Do your devices currently use dhcp to get the ip addresses? If so, everything might "just work" with the new setup. Peter, thank you so much for your post and the information! That router is gigabit capable, and at least two of the office computers are as well (The Photoshop and video editing computers). I'm not sure about the others, though those two computers would likely be the only ones sharing large files anyway. That little 5-port Linksys switch is NOT gigabit capable. Good catch, I'll order a second Trendnet TEG-S80G for the office systems. I have no idea yet what has dhcp or not, except to say that all of the components in the HT have, at one time or another, gotten on the web for firmware updates and such, (though it's been sporadic) and I've never had to manually enter an IP address. So, in hindsight, I guess they do! Looks fine to me--Peter's Gig-E concern is the only thing that jumps at me, and you look like you've got that covered. Thank you, Ken. I really appreciate both you and Peter taking a look! I think Mark has a dedicated NAS, so he wouldn't be using the USB drive option with the 4200. Actually, I don't have a dedicated.... though I've looked into it and don't mind going that way. The "NAS" on my chart was actually going to be a USB drive, (since I have so many lying around!) so thank you David for the warning! Many people are having no issues at all, just be careful what you plug in and make sure it is backed up! Also, I use the same trend net switch (5 port version) for my AV components and it works great. My trendnet switch is hooked into a trendnet 450mb/s ethernet adapter and is not directly wired to the e4200.